Get Creative With Gel Pens #Infographic ~ Visualistan '+g+"
Whether you are coloring in a coloring book, hand-making cards for loved ones or doodling in the margins of your notebook, trying out new tools and techniques can be a great way to revitalize and spice up your mindful creativity practice. I’ve been playing with gel pens recently, which have a water-based gel ink that allows the pens to glide across the page. The ink colors tend to be bright and bold, and some colors let you draw on dark paper, which can be a fun change of pace. Gel pens also let you play with blending tools that don’t work with other types of ink. 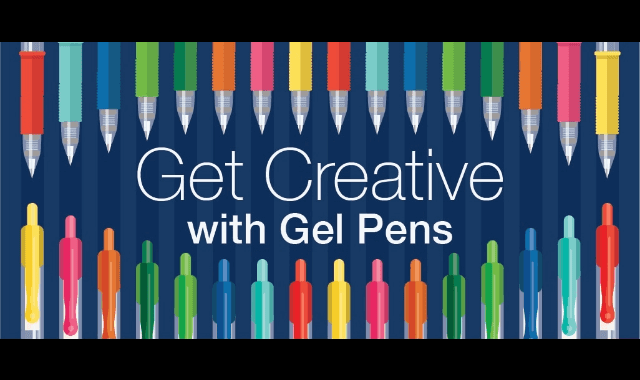 Take a look at this snazzy infographic for some ideas to try with your pens and dive into the fun and fresh practice of gel pen coloring.